In celebration of St. Patty’s Day I whipped up a nice, big, creamy green smoothie. Don’t get a shamrock shake from McDonald’s or guzzle of a bunch of green beer, go the healthy route and drink a delicious green smoothie that will leave you feeling terrific afterwards. If you can’t find enough four leaf clovers to green your smoothie, use whatever you have on hand, whether it be spinach, kale, lettuce, dandelion, beet greens, or a combination. Have fun with this smoothie and add in whatever else sounds good and you have on hand. 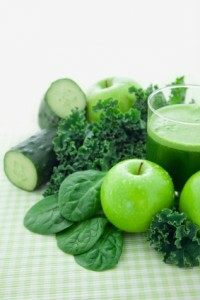 Now for the St. Patty’s Day green smoothie recipe. Enjoy! Leave a comment below if you try this smoothie recipe. Happy St. Patty’s Day! HI,I WOULD LIKE TO TRY YOUR ST.PATRICK’S DAY SMOOTHIE,BUT I DON’T HAVE THE COCONUT OIL,I HAVE THE REST OF THE INGREDIENTS,INCLUDING THE ADD-ONS AND I HAVE PROTEIN POWDER AND GROUND CHIA SEEDS.WOULD IT CHANGE THE TASTE OF THIS SMOOTHIE TO LEAVE OUT THE OIL?CAN I ADD PROTEIN POWDER TO YOUR RECIPE? Omitting the coconut oil won’t hurt anything, Kim. Adding a protein powder is just fine. Hi,this st.paddy’s day smoothie looks really good to make and drink,but it is high in carbohydrates and sugar.would it be to sweet and high in carbs for me to make and drunk?I have type 2 diabetes and I am sure this smoothie will put up my blood sugar a lot. Can I make this smoothie with ingredients that will not bother my blood sugar? I am curious about how this smoothie will taste if I can lower the carbs and sugar in this smoothie. I bet this smoothie will still taste good if you swap out the ingredients high in sugar (banana) for something lower (avocado).